Outdated Joomla 1 / 1.5 website? If your joomla website is still on version 1.0, 1.5, 1.6, 1.7, then your website is seriously outdated. Any version before Joomla 3.4 is a serious security risk to your website, as well as your website host. Don't wait to migrate your website to the latest Joomla 3.4, it may already be hacked. 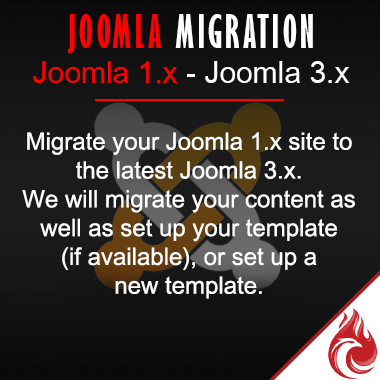 We have successfully migrated hundreds of Joomla sites from version 1.0, 1.5, 1.6, and 1.7 to Joomla 2.5 and Joomla 3.x. It is strongly advised by Joomla to get your Joomla website to the latest version, which currently is Joomla 3.4. Every version of Joomla has a shelf life of +/- 18 months, so it must be made clear that you need to upgrade your site to the latest version every 18 months, so you should always keep this in your budget. If you have a Joomla 1.0 website, you will need to upgrade to 1.5 first, and then upgrade to 2.5, and if you want the latest version of Joomla, you will then need to upgrade to 3.x. There is no way to upgrade from 1.0 to 3.x or 1.5/6/7 to 3.x.